I am taking a brief aside from my hymn reflections to look at another aspect of worship. In this Lenten season we begin by looking at Christ as our example. We reflect on the fullness of His life. His struggles, His triumphs, His sorrows, His joys and most importantly His sacrifice. We look to Jesus as not only our Savior, but our example of living a life in service to the Father. We follow His lead in the examples He set, in the parables He told, in His teaching and in the commands he gave. I want to look specifically at something in this last category. We find the account of the Lords supper in Luke 22 and then find Paul recounting the events with further explanation in 1 Corinthians 11:23 – 32. Then came the day of Unleavened Bread on which the Passover lamb had to be sacrificed. Jesus sent Peter and John, saying, “Go and make preparations for us to eat the Passover.” “Where do you want us to prepare for it?” they asked. He replied, “As you enter the city, a man carrying a jar of water will meet you. Follow him to the house that he enters, and say to the owner of the house, ‘The Teacher asks: Where is the guest room, where I may eat the Passover with my disciples?’ He will show you a large room upstairs, all furnished. Make preparations there.” They left and found things just as Jesus had told them. So they prepared the Passover. When the hour came, Jesus and his apostles reclined at the table. And he said to them, “I have eagerly desired to eat this Passover with you before I suffer. For I tell you, I will not eat it again until it finds fulfillment in the kingdom of God.” After taking the cup, he gave thanks and said, “Take this and divide it among you. For I tell you I will not drink again from the fruit of the vine until the kingdom of God comes.” And he took bread, gave thanks and broke it, and gave it to them, saying, “This is my body given for you; do this in remembrance of me.” In the same way, after the supper he took the cup, saying, “This cup is the new covenant in my blood, which is poured out for you. For I received from the Lord what I also passed on to you: The Lord Jesus, on the night he was betrayed, took bread, and when he had given thanks, he broke it and said, “This is my body, which is for you; do this in remembrance of me.” In the same way, after supper he took the cup, saying, “This cup is the new covenant in my blood; do this, whenever you drink it, in remembrance of me.” For whenever you eat this bread and drink this cup, you proclaim the Lord’s death until he comes. So then, whoever eats the bread or drinks the cup of the Lord in an unworthy manner will be guilty of sinning against the body and blood of the Lord. Everyone ought to examine themselves before they eat of the bread and drink from the cup. For those who eat and drink without discerning the body of Christ eat and drink judgment on themselves. That is why many among you are weak and sick, and a number of you have fallen asleep. But if we were more discerning with regard to ourselves, we would not come under such judgment. Nevertheless, when we are judged in this way by the Lord, we are being disciplined so that we will not be finally condemned with the world. Now I realize that we could get caught up here in a debate on the substance of the Lord’s Supper, but the final conclusion will be that people hold many different position from Transubstantiation to Memorial. But from whichever belief you come, as believers we are to take part in The Lord’s Supper with remembrance of Christ. 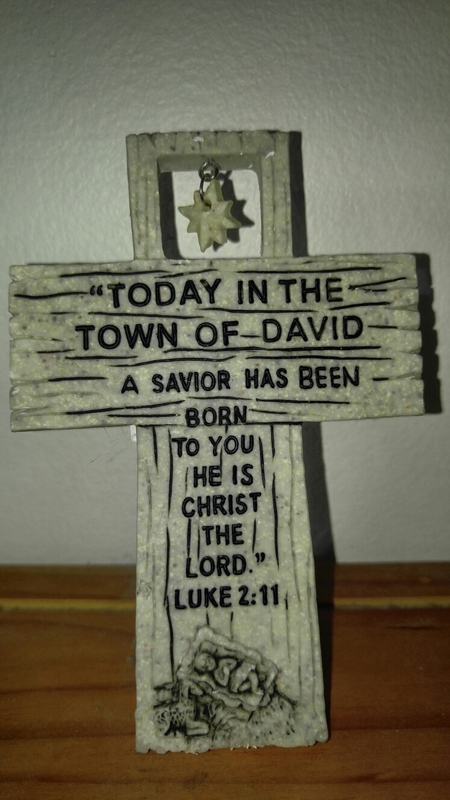 We remember that He was born into this world in human flesh. John 1:14 tells us, “The Word became flesh and made his dwelling among us.” This is of utmost importance, for the manger and the cross are intrinsically linked. Remove one and the other becomes meaningless. You can find more of this in the article, The Real Meaning of Christmas. We remember that while he was born fully man, He was still fully God. John 1:1 tells us, “The Word became flesh and made his dwelling among us.” He was Emanuel, God with us. Not a God who remained distant from us, but a God who dwelt among us. He walked among us that He might know us and we might know Him. We remember that he came to “give His life a ransom for many.” (Mark 10:45) He paid the penalty for our sins when He hung upon the cross, His body broken, His blood shed so we might not know death. When we come before the Lord’s table our attitude should be one of remembrance and reflection. For while we remember Christ in all of these ways, we reflect on our lives. Have we remembered to give Christ the recognition He is due? Have we confessed the sin in our lives? Have we sought to live our lives Honoring Him? Have we surrendered our lives to follow Him? These are the questions that we must ask of ourselves as we prepare to partake of the Lord’s Supper, for Paul has warned us in 1 Corinthians 11:28 – 29 that “Everyone ought to examine themselves before they eat of the bread and drink from the cup. For those who eat and drink without discerning the body of Christ eat and drink judgment on themselves.” When we fail to properly prepare for the Lord’s Supper and when we fail to remember the real reason that we partake of the Lord’s supper, we make it meaningless. We take the incredible sacrifice that the Lord has given and make a mockery of it. This is the judgement Paul refers to in 1 Corinthians 11:29. For we have forgotten that Jesus gave everything for us. So, as we go through this Lenten Season may we be reminded of this truth. May we prepare each day to come before the Lord’s Table. May we remember Jesus and what He has done for us. Let us truly partake of the Lord’s Supper in remembrance of Him. This entry was posted in Devotional, Easter, Lent, Theology, Worship and tagged blood, Bread, Christ, Communion, cross, death, Eucharist, examine, Jesus, Lord's Supper, remember, savior, Wine on March 2, 2015 by Brian Olson. And take His servants up to their eternal home. The trump of God shall sound, rejoice! The Lord is king! Let the earth rejoice! Let the farthest coastlands be glad. Dark clouds surround him. Righteousness and justice are the foundation of his throne. Fire spreads ahead of him and burns up all his foes. His lightning flashes out across the world. The earth sees and trembles. The mountains melt like wax before the Lord, before the Lord of all the earth. The heavens proclaim his righteousness; every nation sees his glory. For one thing, a king is a ruler for life. A reminder that God is not simply in a position of authority here and there. It is authority that spans from the time before creation and on through eternity. Beyond this, a king is usually revered as the sovereign leader of his nation. So God is the sovereign ruler of all He has created. From this world and beyond, He is ruler. And more specifically, He is the absolute ruler over his people. The hymn concludes that our rejoicing in not simply that the Lord is King. We also “Rejoice in glorious hope! Jesus the Judge shall come, And take His servants up to their eternal home.” This is the hope that Paul wrote of in Romans 5:1 – 2 where he states that, “since we have been justified through faith, we have peace with God through our Lord Jesus Christ, through whom we have gained access by faith into this grace in which we now stand. And we boast in the hope of the glory of God.” We have peace with God and can come before the throne of our glorious King. We need not fear Him, for by grace we have been justified through faith in Jesus. This entry was posted in Devotional, Hymns, Worship and tagged celebration, God, Jesus, King, Lord, rejoice, savior, The Lord is King on January 3, 2015 by Brian Olson. Power, all power, surely is Thine! Touch me and heal me, Savior divine. But who are you, a human being, to talk back to God?“Shall what is formed say to the one who formed it, ‘Why did you make me like this?’”Does not the potter have the right to make out of the same lump of clay some pottery for special purposes and some for common use? Do you remember those early art classes from when you were a kid? You know, the one where you got to try everything for the first time. I remember painting pictures, building sculptures and molding bowls out of clay. I look back at those bowls I made from clay, and honestly, I am not sure I would want to actually use it. I now have kids of my own and each them has done likewise. I have developed an appreciation of how special each of these unique items is. But when I walk through a museum and see what such items can be when entrusted to the hands of a master, I am amazed. This same clay that in the hands of a novice a poor excuse for a bowl, in the hands of the master is a work of art. In the hymn, “Have Thine Own Way” we find the theme of the master’s handiwork presented. God has a purpose for each of us. Yes it is true, that one person’s purpose may not seem as spectacular as another’s, but each has a purpose no less or more important than the next. Be it the world famous evangalist or the custodian who picks up that garbage, each is of equal importance to the mission in God’s eyes. It is not an easy thing to do, to ask God to search us. But this is exactly the cry of David in Psalm 139:23 – 24 when he writes, “Search me, God, and know my heart; test me and know my anxious thoughts. See if there is any offensive way in me, and lead me in the way everlasting.” David understood what each of us must as well. If our true desire is to be used of God, then we need to let Him bring to light in our lives all those things that may be standing in the way. Only when we know what we are holding onto, will we be able to let go of them. Only when we allow God to clean us can we live up to our potential use in His plan. Only when our heart cries out “Wounded and weary, help me, I pray! . . . Touch me and heal me, Savior divine.” will we find strength to stand and to move forward. This entry was posted in Devotional, Hymns, Worship and tagged clay, form me, God, God's purpose, Jesus, Lord, make me, mold me, potter, savior, the master's hands, the Potter, use me, Whiter than snow on December 29, 2014 by Brian Olson.